In addition to delivering content to 45 digital displays across its U.S. facilities, Schreiber’s facility-wide network is also being expanded to the company’s foreign plants, with the first being the Mexico plant Centrally controlled from Green Bay, the network allows the firm’s plants and distribution centers to add local content in order to better target and engage in-house staff. The peripheral installations function like syndicated TV networks, slotting in time for relevant local content next to company-wide broadcasts. Using powerful visual communications software, the company benefits from scheduling, management, and simple content creation tools — letting communications staff easily create, distribute, and curate content for a worldwide workforce. In addition to an all-campus channel, Schreiber was looking to implement a multi-screen video wall to greet employees and guests in the lobby as they entered the company’s new state-of-the-art corporate headquarters. 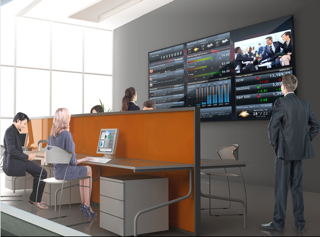 Displayed across three screens, the channel immerses users in the company’s history, milestones, and origins using an interactive timeline that users can access by tapping the screen. Divided into several areas, the visual space also celebrates Schreiber staff by showcasing employee testimonials and quotes, provides an interactive globe where users can browse the company’s global locations, and offers information on Schreiber’s different lines of dairy products. By telling its story through a combination of images, videos, and graphics, the company creates an impactful scene at the facility’s entrance that reinforces and enhances its brand. To ensure accessibility for disabled users, viewers can also use a nearby tablet to view and control the interactive installation. Managed and updated by the Schreiber Communications Department, content producers deliver content using centralized visual communications software — allowing staff to easily add or modify content using a portfolio of intuitive drag-and-drop tools. By leveraging today’s visual communications technology, companies like Schreiber are able to create a strong corporate voice that pierces through the clutter of everyday information. Delivering timely and relevant content, this new method of direct communication increases trust, reinforces commitment, and empowers organizations to more easily adapt to continuously changing business environments. Facilitated by intuitive content management software, visual communications infrastructures are effectively removing filters between employees and decision-makers, allowing communications staff to broadcast material that can increase productivity, promote brand awareness, and bolster a company’s corporate culture. Vern Freedlander is vice president of production services for Montréal-based X2O Media (www.x2omedia.com), a Barco company. He can be reached at vernon.freedlander@barco.com.